Light Source that wont melt ice? I was working on some stuff for my next puzzle map and i have a room full of ice. But it's really dark in there. Does anyone have any ideas of a way i can light it up without melting the ice. I tried torches and glowstone but they melt ice. P.s. Sorry if this is in the wrong section didn't really know where to put it. I wonder what i should put in my sig? 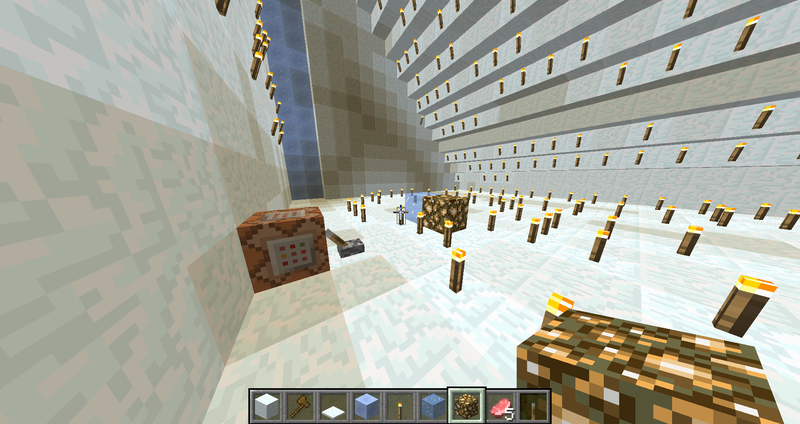 Portal blocks provide good light and the last I checked which was a while ago, they didn't melt snow in my map. If you can get a mod like invedit or single player commands you can spawn them. Thanks guys. I'll try those out. Ice melts at light level 12 from any lightsource, bar the sun. mushrooms might light it up but they give off a very small amount of light, probably the same amount as a portal tho. if anything i would use active redstone behind a wall like this. Nixfriarr and enchilado are both correct. Ice melts due to the light level it's exposed to. I would either used recessed torches or redstone torches to provide light. If you had SPC, you can perform the lighting bug with glowstone. I don't think it melts ice as the actual block doesn't exist, but the light source does. couldn't you put glass holes in the ceiling to let some sunlight through? Who the hell said redstone torches don't melt ice? I have a room filled with ice and lit by torches, not one of them has melted. Message me yours if you want to trade in Animal Crossing: New Leaf or just need some friends to play with. I can also do Pokemon trades in Pokemon X(or Y), but I don't have any good stuff, and the only good stuff I have is not for trade so...send me requests anyway. Quote of the Day:"It's Occam's Shuriken: when the answer is elusive, never rule out ninjas." Try putting glowstone under carpets? I need the complete opposite of this... Someone help plz! !